Can I analyze URLs with Cuckoo? What do I need to use Cuckoo with VMware ESXi? DistributionNotFound / No distribution matching the version..
Cuckoo says there’s a version 2.1.0? New in version 0.5: Native support for URL analysis was added to Cuckoo. New in version 0.5: Cuckoo introduces support for optional full memory dumps, which are created at the end of the analysis process. You can use these memory dumps to perform additional memory forensic analysis with Volatility. Please also consider that we don’t particularly encourage this: since Cuckoo employs some rootkit-like technologies to perform its operations, the results of a forensic analysis would be polluted by the sandbox’s components. To run with VMware vSphere Hypervisor (or ESXi) Cuckoo leverages on libvirt or pyVmomi (the Python SDK for the VMware vSphere API). VMware API are used to take control over virtual machines, though these APIs are available only in the licensed version. In VMware vSphere free edition these APIs are read only, so you will be unable to use it with Cuckoo. For the minimum license needed, please have a look at VMware website. Probably you upgraded it in a wrong way. It’s not a good practice to rewrite the files due to Cuckoo’s complexity and quick evolution. Please follow the upgrade steps described in Upgrading from a previous release. Cuckoo is a mature but always evolving project, it’s possible that you encounter some problems while running it, but before you rush into sending emails to everyone make sure you read what follows. Cuckoo is not meant to be a point-and-click tool: it’s designed to be a highly customizable and configurable solution for somewhat experienced users and malware analysts. It requires you to have a decent understanding of your operating systems, Python, the concepts behind virtualization and sandboxing. We try to make it as easy to use as possible, but you have to keep in mind that it’s not a technology meant to be accessible to just anyone. That being said, if a problem occurs you have to make sure that you did everything you could before asking for time and effort from our developers and users. We just can’t help everyone, we have limited time and it has to be dedicated to the development and fixing of actual bugs. We have extensive documentation, read it carefully. You can’t just skip parts of it. We have a Discussion page where you can find discussion platforms on which we’re frequently helping our users. We have lot of users producing content on Internet, Google it. Spend some of your own time trying fixing the issues before asking ours, you might even get to learn and understand Cuckoo better. Long story short: use the existing resources, put some efforts into it and don’t abuse people. Use a clear and explicit title for your emails: “I have a problem”, “Help me” or “Cuckoo error” are NOT good titles. Explain in details what you’re experiencing. Try to reproduce several times your issue and write down all steps to achieve that. Use no-paste services and link your logs, configuration files and details on your setup. Eventually provide a copy of the analysis that generated the problem. 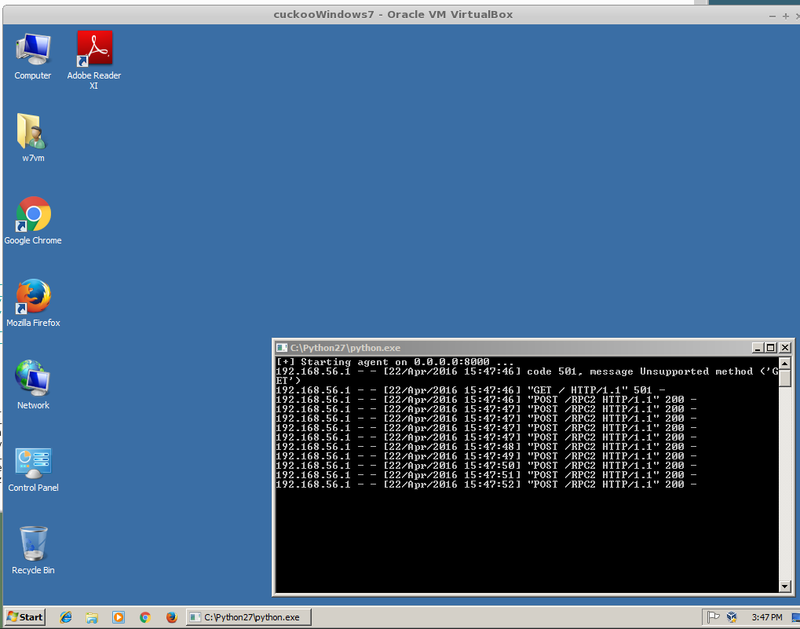 $ virsh snapshot-current "<Name of VM>"
$ virsh snapshot-list "<Name of VM>"
Now the virtual machine state is fixed. It means that Cuckoo is unable to start the result server on the IP address written in cuckoo.conf (or in machinery.conf if you are using the resultserver_ip option inside). This usually happen when you start Cuckoo without bringing up the virtual interface associated with the result server IP address. You can bring it up manually, it depends from one virtualization software to another, but if you don’t know how to do, a good trick is to manually start and stop an analysis virtual machine, this will bring virtual networking up. # If the hostonly interface vboxnet0 does not exist already. The official fixes for this issue can be found in the following commits. Since 2.0-rc1 Cuckoo supports both the legacy Cuckoo Agent as well as a new, REST API-based, Cuckoo Agent for communication between the Guest and the Host machine. The new Cuckoo Agent is an improved Agent in the sense that it also allows usage outside of Cuckoo. As an example, it is used extensively by VMCloak in order to automatically create, configure, and cloak Virtual Machines. Now in order to determine whether the Cuckoo Host is talking to the legacy or new Cuckoo Agent it does a HTTP GET request to the root path (/). The legacy Cuckoo Agent, which is based on xmlrpc, doesn’t handle that specific route and therefore returns an error, 501 Unsupported method. Having said that, the message is not actually an error, it is simply Cuckoo trying to determine to which version of the Cuckoo Agent it is talking. It should be noted that even though there is a new Cuckoo Agent available, backwards compatibility for the legacy Cuckoo Agent is still available and working properly. With the new Cuckoo structure in-place all storage is now, by default, located in ~/.cuckoo, including the PCAP file, which will be stored at ~/.cuckoo/storage/analyses/task_id/dump.pcap. On Ubuntu with AppArmor enabled (default configuration) tcpdump doesn’t have write permission to dot-directories in $HOME, causing the permission denied message and preventing Cuckoo from capturing PCAP files. It is most certainly possible running into this issue when analyzing samples that have a lot of dropped files, so many that the Processing Utility can’t allocate any new file descriptors anymore. The easiest workaround for this issue is to bump the soft and hard file descriptor limit for the current user. This may be done as documented in the following blogpost. In case if you using Supervisor set minfds in supervisord.conf. Remember that you have to login in to a new shell (i.e., usually logout first) session in order for the changes to take effect. Now this is quite odd, as generally speaking we’ve specifically requested pip to install all dependencies with their exact version (and in fact, if you look at pip freeze you’ll see the correct version), but it does happen sometimes that older versions of various libraries are still around. Then reinstalling Cuckoo again is simply invoking pip install -U cuckoo or similar. This issue may appear at runtime after tinkering with settings in $CWD/conf, as input is passed to the configuration parser at runtime unescaped. Double-check your configuration files with an eye out for potentially troublesome character combinations such as %(. The IP address of the VM has been configured incorrectly. Please verify that the VM has a static IP address, that it matches the one in the Cuckoo configuration, and that the configured network interface exists and is up. Also, in case of VirtualBox, did you configure the network interface to be a Host-Only interface? Check that there are no firewalls in-place that hinder the communication between your Host and Guest and double check that the Host and Guest can ping each other as well as connect to each other. Is the network configuration equivalent on the host and in the VM? If not, e.g., if the VM sees different IP ranges, then you’ll have to configure the resultserver_ip and resultserver_port, for which we have separate documentation. If you’ve modified the Cuckoo Analyzer (located at $CWD/analyzer) this error message may indicate that a syntax error or other exception was introduced, preventing the Analyzer from being properly started, and thus not being able to perform the analysis as expected. If you’ve triple-checked the above and are still experiencing issues, then please contact us through one of the various communication channels. If you see this message, it means Cuckoo is throwing an error before its loggers are initialized. This might happen if database migration or CWD updates are required. © Copyright 2010-2018, Cuckoo Foundation Revision 9aa8bde2.